Send and schedule updates to Google + page from Hootsuite. When you start using social networking platforms, you will be marking your online presence. To stay connected with friends and around the world. This makes you join most familiar Social networking platforms and stay active in those sites. Creating an account is important but maintaining all the social platforms is also very important. Most of the web applications has integrated Twitter, Facebook and LinkedIn updates as they are ruling the social media market. So when you are planning to stay connected with social media platforms, you might have noticed that you can’t post your updates to Google + Page other than logging in to your Google profile.. But now, Google + Page is supporting third-party applications you can send updates from any other platform. Hootsuite is leading the social media with a huge user base and allowing users to post updates cross platforms. You can customize the updates accordingly, but in that too you need to be a premium user if you want to use Hootsuite in a better way with all the analytical tools. With the integration of Google + in Hootsuite you can even schedule all your post. This makes it more easy with one click posting to various social media platforms. Selecting the profiles or pages which you need to send the updates via Hootsuite. As Hootsuite support all the major social media platforms like Twitter, LinkedIn, Facebook, WordPress, Foursquare, Mixi it has become more easy to show up your online presence. If you are concerned about the privacy point of view, I must say Hootsuite has better options for it. When you post the update and click on the privacy button it will fetch your Google Circles which you need to share. 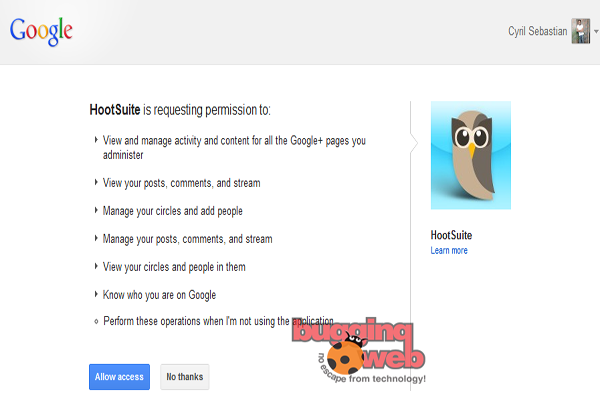 I have seen many users who use Hootsuite as the primary web application to post their updates than using Facebook and Twitter as it support all the major social networking sites. The scheduling features makes the user online most of the time, thus making most familiar among all. « Basic steps to use UNIX/LINUX – for beginners.